Now you are ready to turn the Voxel8 Printer on. 1. Relocate the power button on the lower left rear of the Voxel8 Printer (see Picture 001). 3. Switch the power button from “0” state to “1” state to turn it on (see Picture 002). Picture 002: Powering on the machine. NOTE: Depending on your setup area, you may have to reach around the metal flange at the back corner of the printer to reach the power button. 4. Watch the front touch panel display during its booting procedure. 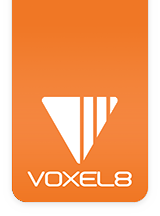 The Voxel8 logo will appear (see Picture 003) and the touch screen interface will load. Picture 003: Voxel8 Developer's Kit Boot Sequence. 5. While the machine is running its boot cycle, it is a good idea to record your Voxel8 serial number located on the back of the machine (see Picture 004A). Picture 004A: The sticker on the back of the printer with your unique serial number. NOTE: Your serial number will be used to uniquely identify your machine when servicing or troubleshooting with support. You should write this down, or otherwise record it for easy access in the future. Do not share your serial number.